﻿﻿﻿﻿Perhaps every family in the United States has a family member or a freind that has or is serving in the United States Military. Some of our loved ones were severely injuried, while others seem to be healing from their physical and emotional scars. Honorariums are a special way of saying "thank you for your service to our nation" and "I love you and am so proud of you." The Kentucky Veterans of the Year specializes in praising and thanking our veterans. Let us help you make your favorite veteran feel loved and honored. Honorarium gifts include one line in the event program. Name, rank, and military service is required, war-time service will be noted at your request. The $5 cost is the minimum donation to help with printing costs. Additional donations above the $5 cost are appreciated are will be used to defray the cost of the banquet. No donation amounts will be listed or revealed to the one honored. A beautiful card will be sent to the veteran you have honored letting them know how special they are to you. Honored Veterans need not be Kentucky Residents to be listed (this statement applies only to honorariums. 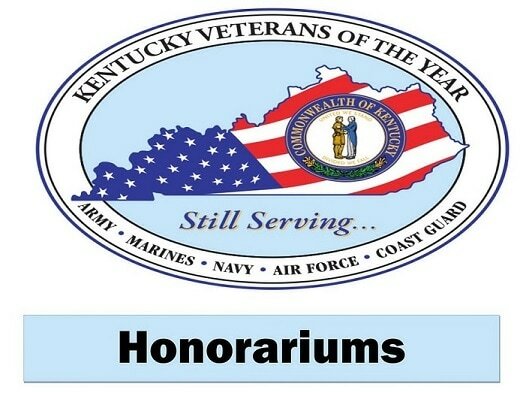 To be nominated as a Kentucky Veterans of the Year candidate, the veteran must be a Kentucky resident).